Making steady progress with my reconstruction of the Bass of Inverurie. I am still at the 3D modelling stage and trying different things out to see what works and what doesn't. This project is teaching me lots of new things, which is always a happy outcome, but there remain many unanswered questions. I may never find the answers I’m looking for, so the best I can do is to get as close as I can to satisfying the experts and then accompany my reconstruction with the usual cautionary note of conjecture! 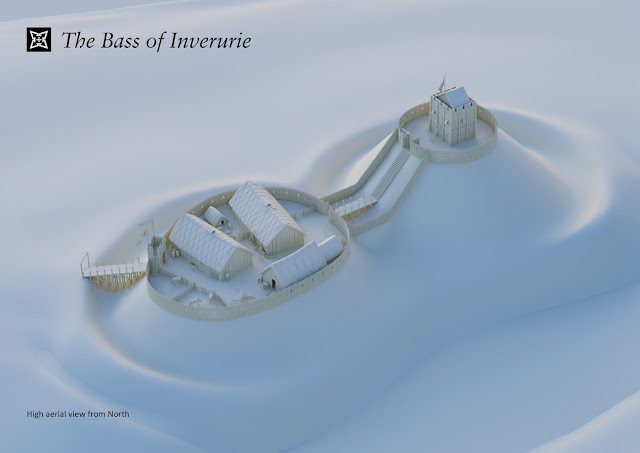 Bass of Inverurie - Untextured 3D model (Third draft). The project has reached the third draft stage and I feel that I am getting closer to what I think I can call a considered reconstruction, but there are a few elements that may yet change. Archaeology and heritage consultants, Peter Yeoman and Simon Forder (http://thecastleguy.co.uk), have kindly provided me with some useful feedback on my developing 3D model and I am extremely grateful to them for sharing their wisdom and expertise. I am coming to terms with the understanding that the Bass was a much less substantial fortification than the one I had originally imagined. My first draft of the castle took on too much of the form of the classic Anglo-Norman motte-and-bailey timber castle of the type that rapidly began to dominate the lands of England and Wales following the Norman Conquest. In Scotland, the Norman influence on castle design is a much more gradual affair due to its resistance of the Norman advances over a much longer period. Fortifications here adopted the form of earlier strongholds which is understood to be the case at Inverurie. Exactly what type of fortification pre-dated the twelfth-century Inverurie castle is unknown, but its slopes were clearly scarped or landscaped to form the familiar motte and bailey earthworks we can still see to this day [Davidson, 1878]. In this, my third draft of the 3D model, I continue to show an Anglo-Norman timber tower atop the motte but this is debatable. There is no evidence to suggest it was a timber tower and it could have been a much simpler type of structure, so I may yet revise this. 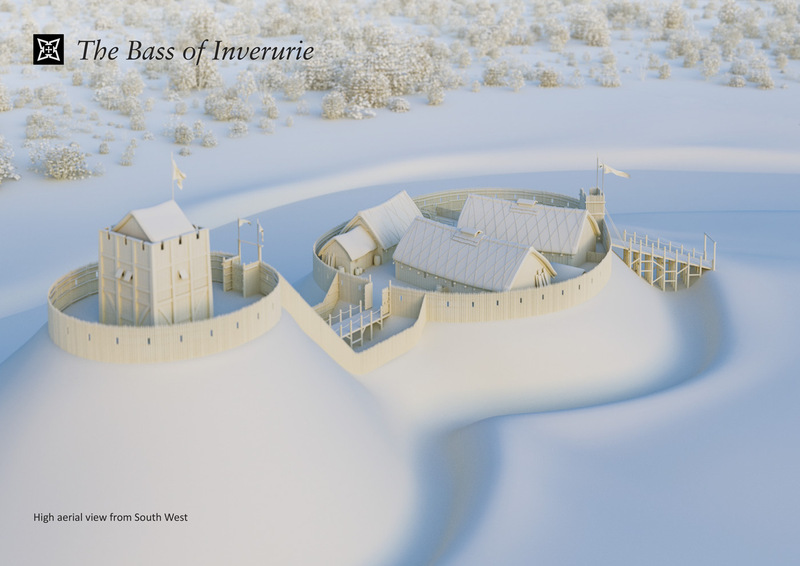 While remembering the high status of its owner, the builders of the castle at Inverurie would have likely utilised what existing resources they could get hold of in order to construct it quickly. To use so much timber would have taken an army considerable time and engineering skill to erect, and such skills were probably in short supply this far north. Earl David and the retinue he travelled with likely only spent a few days or weeks of the year in residence here to avoid draining the resources of his lordships. For most of the time, he would have been kept occupied with his vast estates and interests in other parts of the Kingdom, not forgetting of course, his time spent in the Holy Lands in support of Richard I. 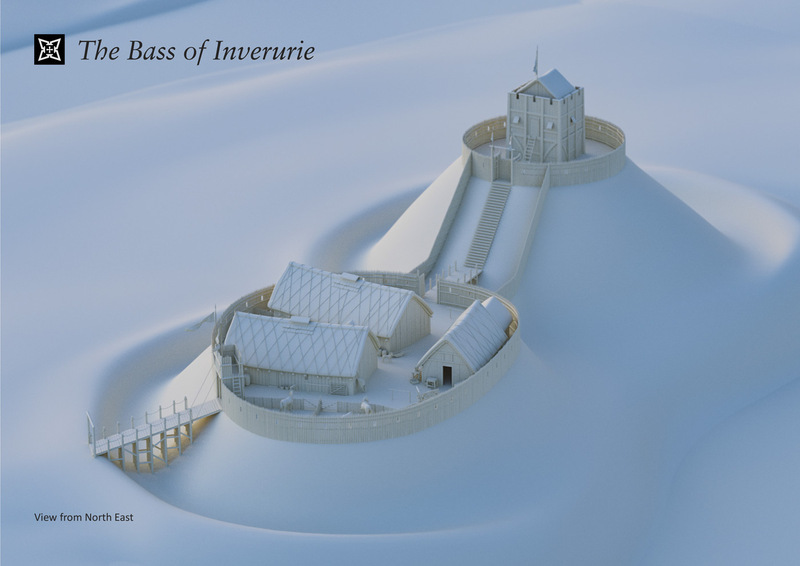 So, the Bass was probably much less formal than the timber castles existent in the south of the land. I have changed the shape of the bailey and the ditch surrounding the castle in this third draft. The bailey is now about 15% larger, we believe because some of its area was excavated away during landscaping work carried out on the graveyard in the late nineteenth century. The bailey is now large enough to accommodate two buildings which fit the vague footprints we can see from this RCAHMS plan drawing - https://canmore.org.uk/collection/1333029. At the moment, my interpretation is that at least one of these two buildings was a long hall house. The purpose of the second building is unknown. It may have been another hall, stabling for horses, a workshop or kitchens. There is just about enough space for another building to the north of the bailey but this is pure conjecture. I have reduced the quantity of timber in my third draft model – the tower is one storey shorter (I am considering whether to replace this with something different), the timber palisades are shorter and I have removed the raised wall-walks. The link between the upper and lower enclosures of the castle remains unexplained, so I have tried to interpret this as a low bridge with roped sides leading to stairs ascending the motte with a protective timber palisade at either side. The other major change that I made to the model was to terminate the ditch on its northwest and northeast side. A late nineteenth-century OS map and an old photograph reveal what we think was the outward-facing side of an earthwork rampart. The area to the north side of the Bass (the motte) and Little Bass (the bailey) was probably terraced but without a defensive ditch. The river Urie ran alongside the castle here – itself a natural defensive feature. The ditch and rampart are now lost due to landscaping of the graveyard carried out at the end of the nineteenth century. An aerial photograph taken during the winter of 2016 shows the impact of devastating local floods on the area. The image demonstrates that this c19th landscaping work has caused more of the land to be exposed to flooding. Originally, the castle and its outer defensive ditch must have been just high enough above the reach of the river when these floods occurred in the past. My attention is now turning to adding detail to this model, rendering out some different perspective views, and then the time-consuming task of manual painting in Photoshop. I expect this work to take several weeks to complete. I am abandoning plans to produce a fly-around animation, at least for the time-being. I had planned to make one for this project over the summer and export the model over to a game engine to make something interactive out of it, but I have simply run out of time. 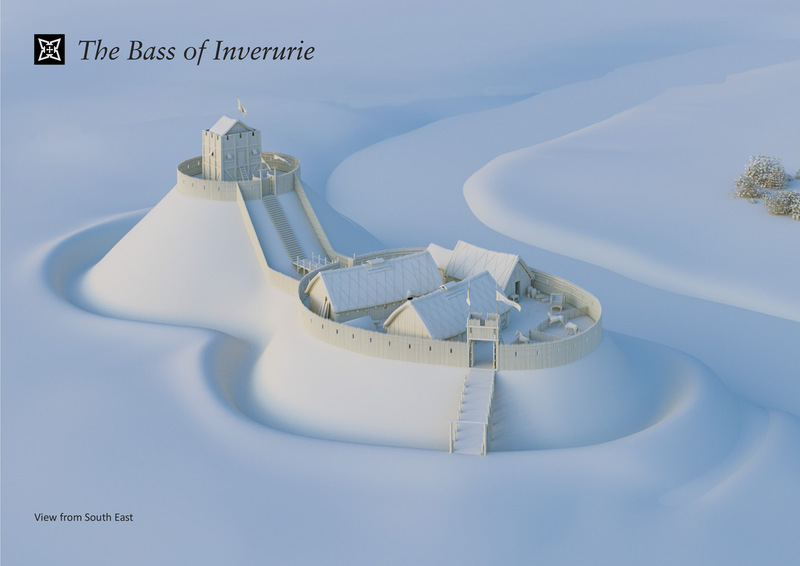 History Scotland Magazine are intending to run a feature on the Bass of Inverurie in their winter edition due for publication in December 2017. 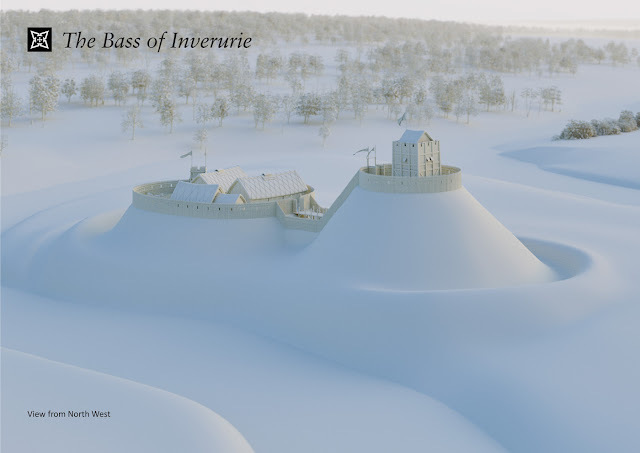 It will feature my completed reconstruction and a short history of the castle and the Earls of Garioch written by historian and castle-enthusiast, David Weinczok. I will post more details over the coming months on my Facebook page. Thank you all, for your interest and support with this project so far. I have had a lot of fun with this. Please feel free to drop me any questions or comments.